Tollywood Bengali film Sunya Anka (Act Zero) movie story review casting director producer cast of Sunya Anka (Act Zero) release date book buy tickets online Bengali Sunya Anka (Act Zero) Konkona, Priyanshu & Soumitra, Sunya Anka (Act Zero) Konkona, Priyanshu & Soumitra, Bengali movie review shooting location cinema halls showing Sunya Anka (Act Zero) Kolkata Bengal show timings upcoming Bengali cinema Sunya Anka (Act Zero) watch online. Rose Valley Films presents the upcoming Tollywood Movie Sunya Anka (Act Zero) directed by film-maker Goutam Ghose starring veteran actor Soumitra Chatterjee along side talented Konkona Sen Sharma & Priyanshu Chatterjee. The Bengali film Sunya Anka (Act Zero) is set to release on 18th January 2013. 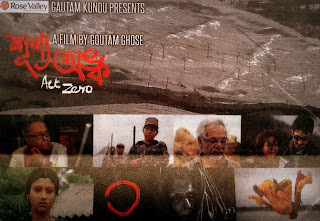 • Sunya Anka (Act Zero) Bengali movie Director Name: - Goutam Ghose. • Sunya Anka (Act Zero) Bengali movie Producer name: - Gautam Kundu (Rose Valley Films). • Sunya Anka (Act Zero) Bengali film Casts Actors Actresses: - Soumitra Chatterjee, Priyanshu Chatterjee, Konkona Sen Sharma & many others. • Sunya Anka (Act Zero) Bengali movie Release Date: - 18th January 2013. • Sunya Anka (Act Zero) Bengali movie Story Review: - Actor Soumitra Chatterjee is playing the character of a Scientist involving in his scientific activities based at Manali. Actress Konkona Sen Sharma portrays a unique role that she never had done before. Film-maker Goutam Ghose always does different projects and his latest film Sunya Anka (Act Zero) is going to be one more. Actor Soumitra Chatterjee & Director Goutam Ghose duo had produced super hit Bengali films like 'Dekha' and 'Abar Aranye' and now coming up with Bengali movie Sunya Anka (Act Zero) with a different story all together. • Cinema Halls showing Sunya Anka (Act Zero) Bengali movie: - Let’s check out the Cinema Hall names showing Shunyo Awnko Bengali film in Kolkata & other areas of West Bengal on & from 18th January 2013 (release date) – Nandan-1 (Rabindra Sadan), Priya, Mitra (Noon Show), London Parris (Ballygunje), FAME (South City, Hiland Park, Hind), Ajanta (Behala), Ashoka (Behala), Malancha, Jaya (Laketown), Jaya Multiplex (Barasat), Padma, Inox (Forum, City Centre, Swabhumi, Rajarhat, Liluah, Durgapur, Burdwan, Siliguri 1 & 2), Broadway (Salt Lake), Big Cinema (Salt Lake), Cinemax (Mani Square), Bioscope (Rajarhat, Durgapur), PVR (Howrah), Gitanjali (Bolpur), Kristi (Memari), Netaji Subhas (Baidyabati), Rtwik Sadan (Berhampore), Sanskriti Lokmancha (Burdwan), Balaka (Ilambazar), Eylex (Asansol), Cinemax (Siliguri), Satyajit Mancha (Balurghat), Rupashi (Agartala) and many other Cinema halls in West Bengal showing Shunyo Awnko Bengali movie. New Bengali movie / Tollywood film Shunyo Awnko (Act Zero) of Konkona, Priyanshu & Soumitra seems to be worth watching in Cinema Hall; so start buy tickets online of Sunya Anka (Act Zero) from www.bookmyshow.com website. Famous Bengali Actress Director Aparna Sen and Daughter Konkona Sen Sharma has jointly worked once again under Shree Venkatesh Films banner and Aparna Sen's directed Tollywood Movie "Iti Mrinalini". The story of Iti Mrinalini Bangla Cinema of Aparna Sen & Konkona Sen Sharma, mainly based on an actress who wants to commit suicide in her old ages and then how she stops herself from committing suicide by remembering past life. Bengali Film Iti Mrinalini casts: Suzanne Bernert, Aparna Sen, Konkona Sen Sharma, Rajat Kapoor, Priyanshu Chatterjee, Kaushik Sen and many others.